Special Operations Test - What Is the C-SORT? When you first visit a recruiting office and you know you want to join Navy Special Warfare, you should know you have to ace the fitness test, score well on the ASVAB, and the C-SORT. You cannot study for the CSORT, but you can and should prepare months in advance of your first recruiting office visit having studied the ASVAB and practiced the elements of the Navy Special Warfare/Operation Physical Screening Test (PST). Performance strategies: The use of stress coping tools such as self-talk, breathing, and goal setting abilities are tested in this section. Psychological resilience: How a recruit deals with stressful and unpleasant situations as well as mental challenges and threats will also be tested in this section. Personality traits: This section is mainly used for statistical analysis as there are many personality traits that make it through SEAL training. A recruit can only take the C-SORT one time, and there is no study guide. The best advice is to read the questions carefully and answer honestly even though there may be more than one answer to questions that fit your character. The C-SORT is graded on a scale of one to four (1 to 4). If you score a 4 on the C-SORT you are considered to have a high resiliency level. The two cardiovascular endurance events of the PST - the 500 yard swim time and 1.5-mile run - are timed and added together and then combined with the grade of the C-SORT. If you score well on both, you can quickly qualify for SEAL training after Navy Boot Camp. However, a score of 1 on the C-SORT is the lowest, and you will have to combine a much higher physical screening test (run and swim time) score to prove you have the ability to work hard with a strong foundation of fitness. 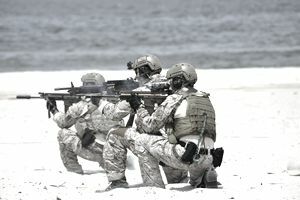 Recruits take the PST several times while in the Delayed Entry Program (usually 2 to 3 times a month) with a SEAL Mentor in the recruiting district. By showing the recruiters you can work hard and improve your fitness test scores, you can get to SEAL Training (BUD/S) even without a high C-SORT score. Having high scores of near 8-minute swim or less and a near 9-minute run or less shows effort on the recruit's part and a will to work hard to achieve those scores. Recruits will also have to score high on the ASVAB as well. Consider your first PST with the SEAL Mentor in your recruiting district YOUR job interview. You will be placed in one of two groups after taking this test for the first time: the passing group or the failing group. If you fail, you will be required to train on your own and come back multiple times until you pass it. If you do not pass the PST eventually, you will be sent to boot camp anyway having not pre-qualified for SEAL training and you will be forced to do a different job. Be patient and train hard prior to walking into the recruiter's office the first time. You should be able to master the competitive scores on the PST and have taken the PST on your own dozens of times that you can pass it with ease the first attempt. Once you pass the PST and score well enough to be competitively selected in a nationwide draft, you will get your shipping out date to boot camp and then onto the follow-on training called Pre-BUD/S. This is a 6- to 8-week course that physically prepares you for the events at SEAL training and SWCC Training. After Pre-BUD/S, you will be shipped to Coronado, CA and attend SEAL training.